ARF | Cats | I'm Paris, Adopt Me! Seven-year-old Paris is as full of light and sparkle as the city she's named for. Although she's 7 years old, to her that's just a number, and she's as full of curiousity and enthusiasm as a kitten. She's fond of new people and has no trouble making friends and occupying a lap within moments of meeting someone. She's a confident lady and enjoys new environments so she can go on long exploring expeditions. Paris has spent her whole life with her wonderful brother London, and the two will need to accompany each other to their forever home. This means twice as much love for their new family. Paris’ adopter must be at least 18 years old with valid-state issued identification. ARF encourages family members to participate in the adoption process, especially children. 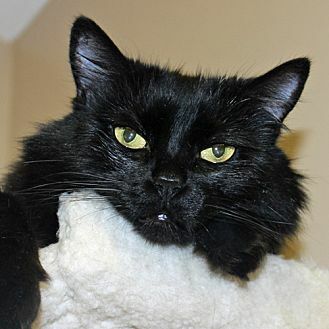 Please visit ARF's web site for information on adoption and to view more great cats. [description] => Seven-year-old Paris is as full of light and sparkle as the city she's named for. Although she's 7 years old, to her that's just a number, and she's as full of curiousity and enthusiasm as a kitten. She's fond of new people and has no trouble making friends and occupying a lap within moments of meeting someone. She's a confident lady and enjoys new environments so she can go on long exploring expeditions. Paris has spent her whole life with her wonderful brother London, and the two will need to accompany each other to their forever home. This means twice as much love for their new family.